Note-This tutorial was written on readers' request. Got your school/college/university teachers or parents on Facebook? Do they find you online all the time, embarrassing and you know the other consequences? 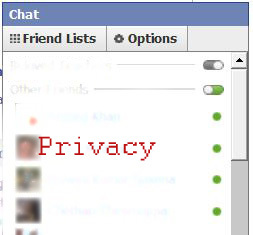 Facebook got another privacy issue,. Here is a simple trick which would let you be offline only to the particular friends and online to rest. Here we will be using Facebook's new list feature. How To Appear Offline to Specific Friends on Facebook? 2. Click on the button "Create a list" located on top of the page. Create a list Offline or Hide or anything else. 3. Now add the facebook friends you want to appear offline to. 4. On the chatbox, you would find your newly created friend list appearing. Click on the green slider button beside the name of your list. If it's green, your friends on the list can see you online, if it's gray, that's what you wanted. For best practice, create multiple lists and put only one friend on the list, this way you can make friends offline individually.